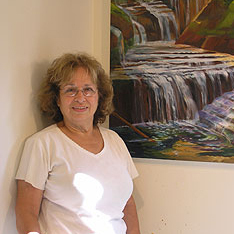 Hilda Green Demsky is a painter who creates works based off of sites where she feels are most renewing and tranquil. She holds a B.F.A degree from Carnegie Mellon University and a M.A from Hunter College. She has received several awards including: The Fullbright Fellowship to the Netherlands, The National Endowment for the Arts, Certificate of Merit from the NYS Board of Legislators, and Andy Warhol Visual Arts Residency. She has also written a retrospective book, Hilda Green Demsky: The Flow of the Artist’s Life and Work, highlighting her six decades of painting. Demsky works at Manhattanville College and lives in Larchmont, NY.